Is Angkor Wat worth it? 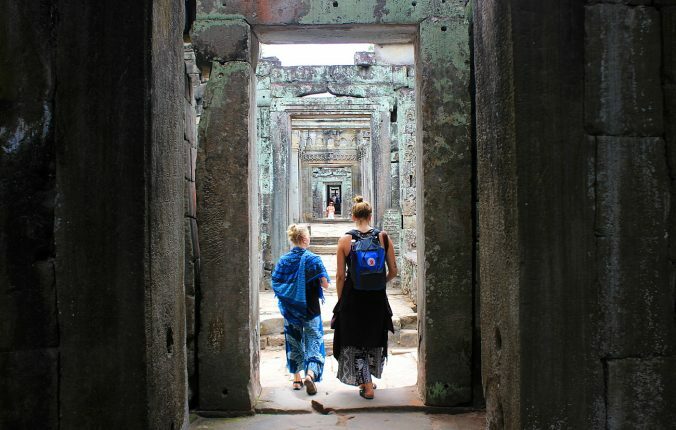 The ruins of Angkor are famous all over the world, but are they as impressive as people say? Visiting Cambodia without going to Angkor Wat is like going to India without seeing Taj Mahal. Or okay, it’s not exactly the same: India has plenty of other famous historical sites around the country, Cambodia doesn’t. When travellers talk about Angkor Wat, they usually mean the larger ruins of Angkor which include the temple of Angkor Wat. 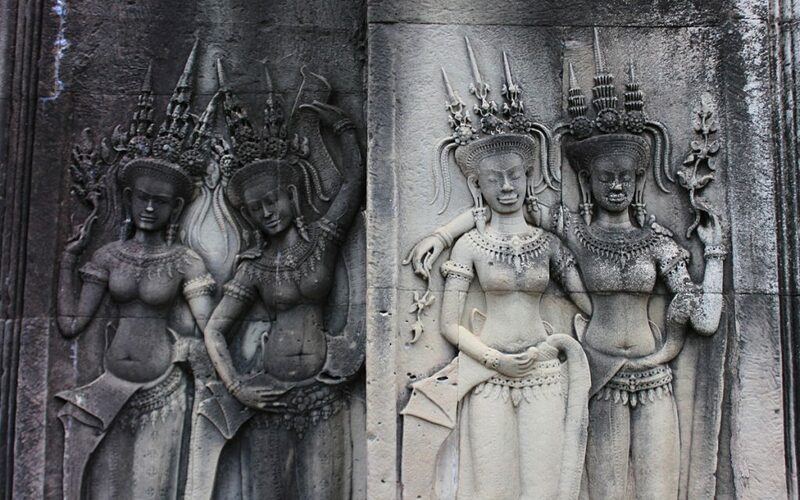 Angkor was the capital of the historical Khmer Empire that flourished approximately from the 9th to the 15th century. At its peak, Angkor was the largest city of pre-industrial era. Visiting Angkor doesn’t come cheap. A day pass to the area costs 20$. The price for a day is a bit cheaper with a 3-day (40$ in total) or 7-day (60$) pass. You can only see a portion of the ruins in one day, but staying in the area for longer is not necessary. After all, the ruins are not extremely different from each other. Besides the ticket, you also need to pay for transport. Renting a bicycle is an option, but the distances are quite long. Me and three other Finnish backpackers hired a tuk tuk for the day, which cost 25$ in total (6.25$/person). Had we skipped the sunrise, the same tour would have cost us 20$. On the next part of this blog post, I go through our day trip to Angkor Wat. After that I ponder if Angkor Wat is worth visiting. 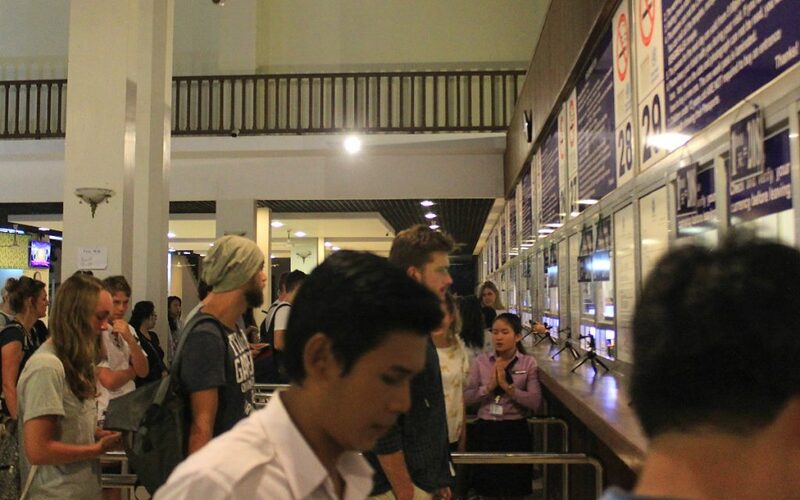 The popularity of Angkor Wat hits you at the ticket office. The office is larger than many train stations, with dozens of ticket booths. 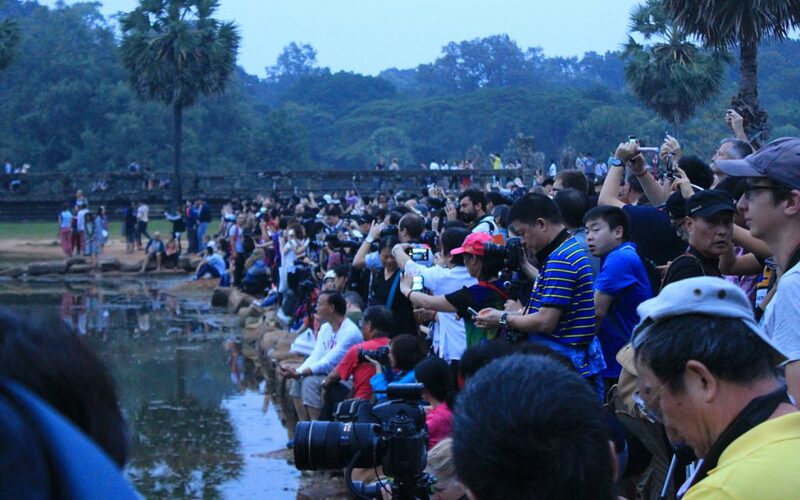 Hundreds of people gather to see the sunrise at Angkor Wat – even on a cloudy day. 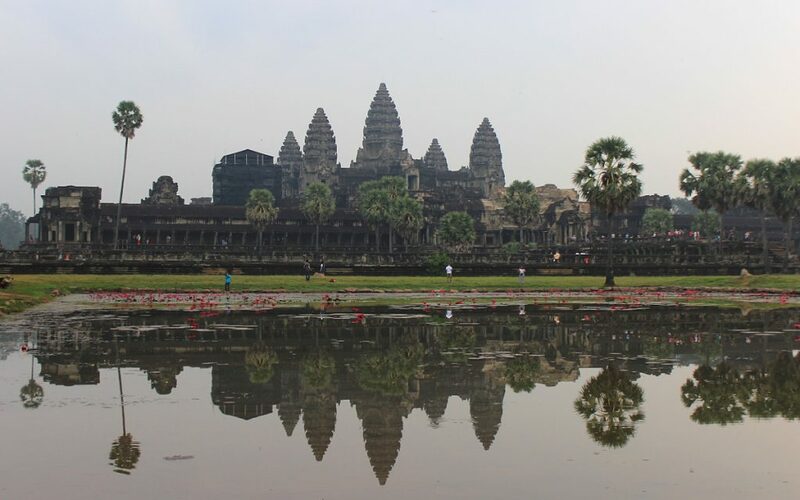 According to Lonely Planet, traveller’s first glimpse of Angkor Wat is “simply staggering” and “matched by only a few selects spots on earth”. I’m not sure if I saw the same building as the Lonely Planet author. Seriously though, Angkor Wat is quite impressive building. The largest religious monument in the world won’t blow your mind, but the wall carvings are quite nice. What Else is There to See in Angkor? The eccentric temple of Bayon is another Lonely Planet favourite. One of its many stone faces even grace the cover of the newest Southeast Asia on a Shoestring guide. A thousand years, and still not finished! Ta Prohm is also known as the Tomb Raider temple, because parts of the 2001 action film starring Angelina Jolie were filmed here. 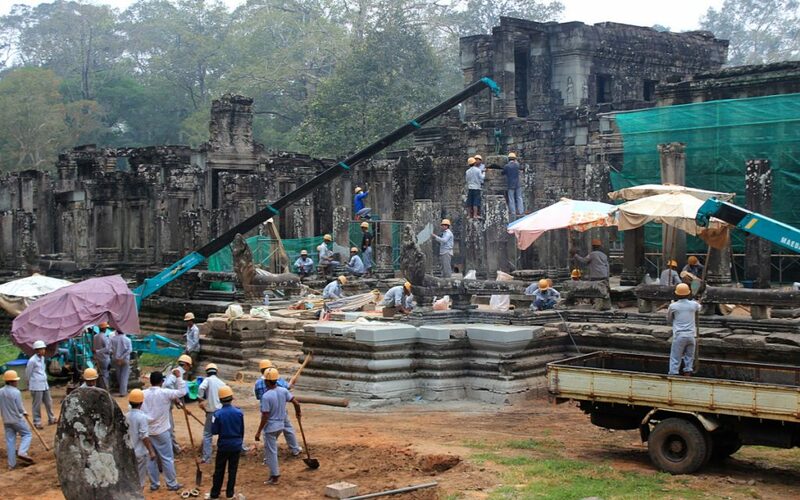 The old action film is still important to the tourism of Cambodia. 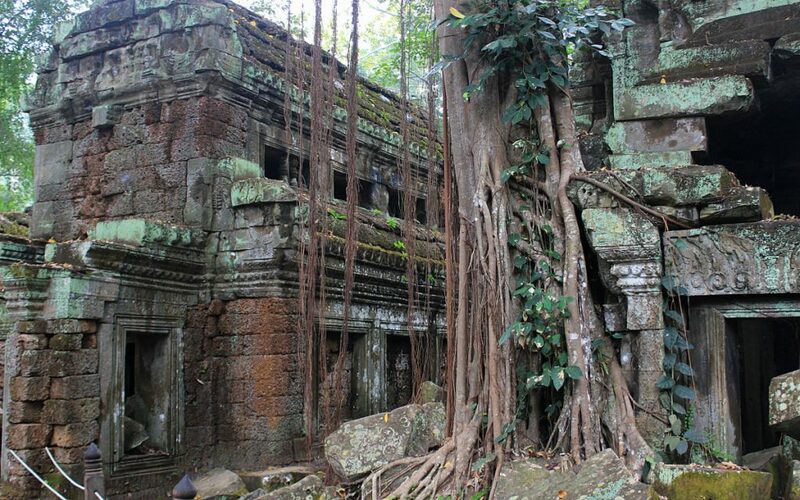 After all, Tomb Raider was a box office success and the first international movie filmed in Cambodia in over 35 years. Besides the ruins themselves, Angkor offers some other spectacular views that make Angkor worth visiting. When you explore, don’t forget to check out these awesome plants! 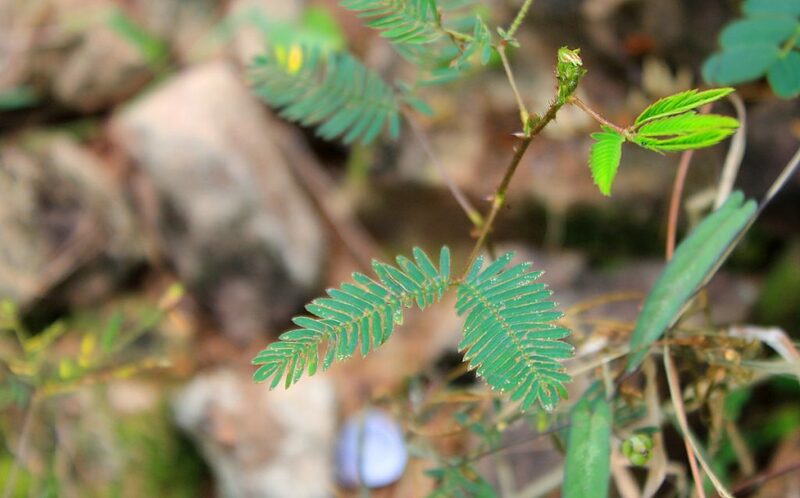 The leaves of Mimosa pudica react to touch by folding quickly. Honestly, the Mimosa pudica (aka “the sensitive plant”) got me more excited than some of the ruins. The Wikipedia page of the plant even has a great gif of the plant in action, showing the rapid folding of its leaves. If you plan to spend a day at the ruins, you need to have a lunch break. This can be surprisingly expensive, as even the simplest meals tend to cost at least 5$. So, is Angkor Wat worth it? Yes, I think so! 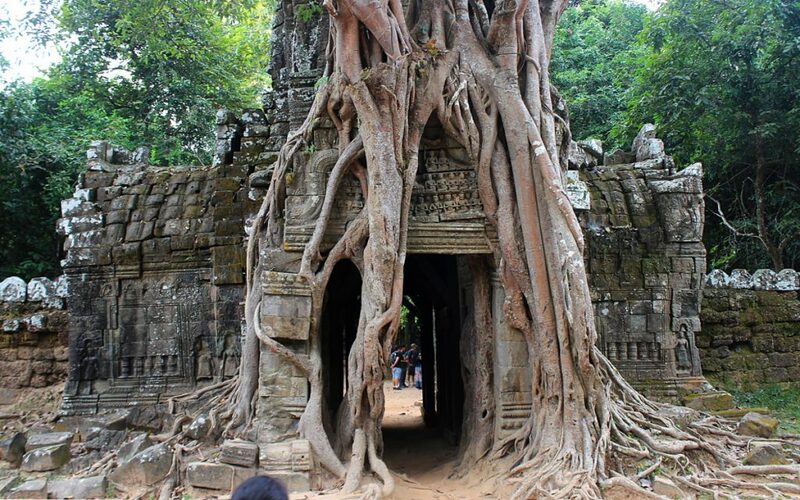 If you’ve never found any ruins interesting, the temples of Angkor in Cambodia won’t change your mind. I personally found my visit to Angkor better than I expected. I haven’t always been very impressed by other ruins I’ve seen, but I enjoyed visiting Angkor. I especially found the areas where giant trees had taken over the structures to be very intriguing. More importantly, I enjoyed my tour because I had some great company. 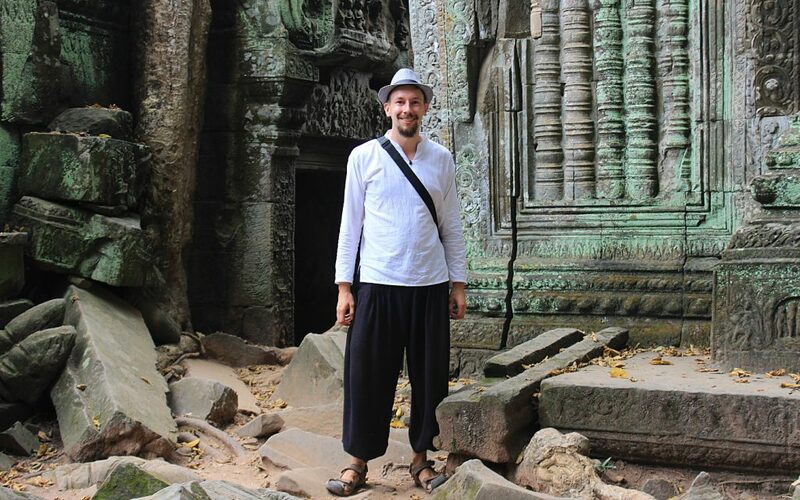 After months of solo travel, exploring the ruins in a group can be very interesting – especially when the other backpackers have done more research than yourself. When you hear about the history, the stories breathe life to the piles of stones. 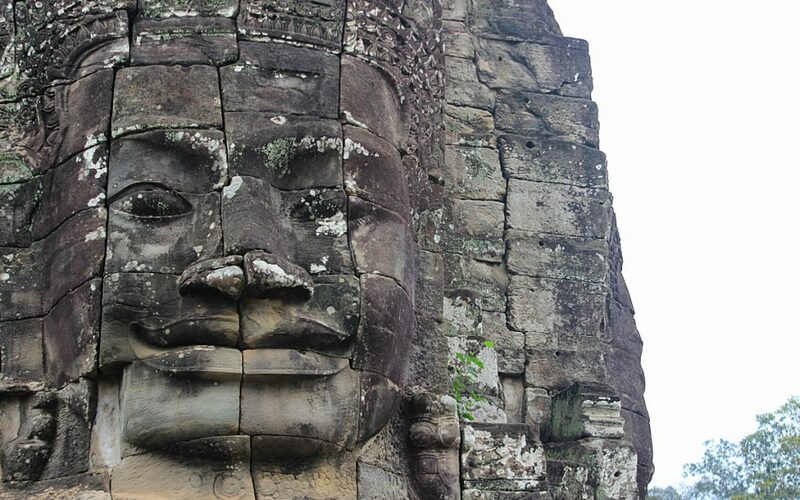 A little known fact: the ancient Khmer population of Angkor used to worship Lord Voldemort. Coming all the way to Angkor for only one day is a crime. The area is one of the biggest and most interesting historical artefacts in the world. Then you spent 2 weeks in Pokhara, Nepal, a place totally devoid of any culture and just a modern tourist trap. This certainly makes me to question your priorities. I understand your point of view, and I think it’s mainly a matter of taste. 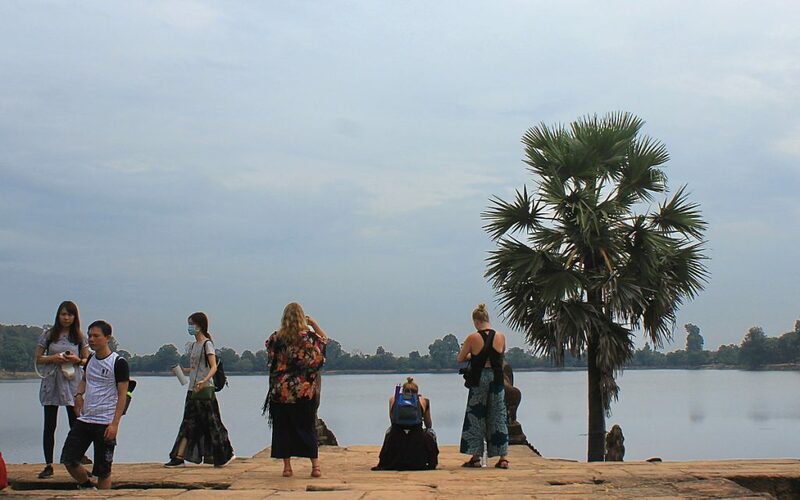 I believe that one day in Angkor gives a person enough time to get a solid impression of the place. I could have probably enjoyed more days on the site, but it didn’t fit my schedule and I didn’t feel like it was completely necessary. I was traveling with other people and I had limited time at that point. Still, if someone else likes to spend several days in Angkor, Persepolis, Hampi, Gunung Padang or some other sight, that’s just great! 🙂 I’ve got nothing against it. I think everyone should just travel the way they like, not trying to follow what someone else is doing. 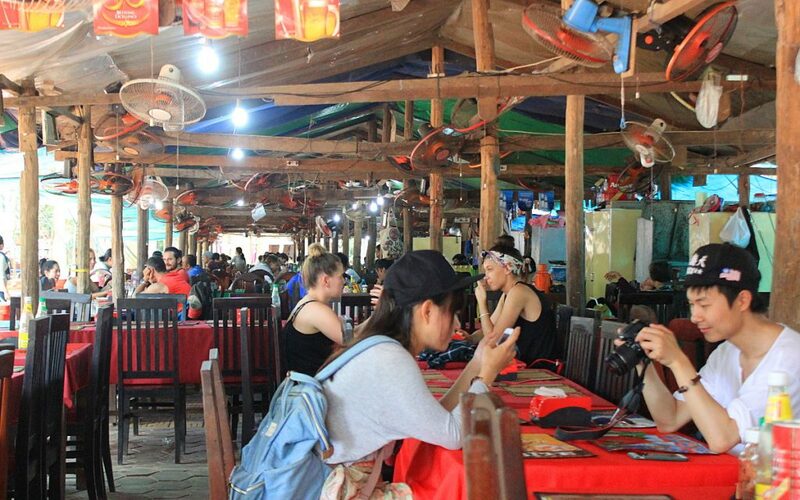 At the same time, I wouldn’t say my one day in Angkor and three weeks in Pokhara are completely comparable. While in Pokhara, I spent that time taking daily private lessons of Nepalese language. No, there were no historical sites nearby, but befriending with locals definitely helped me delve deeper into the contemporary culture and society of Nepal.